LOCK DOWN | Pro Chem, Inc. 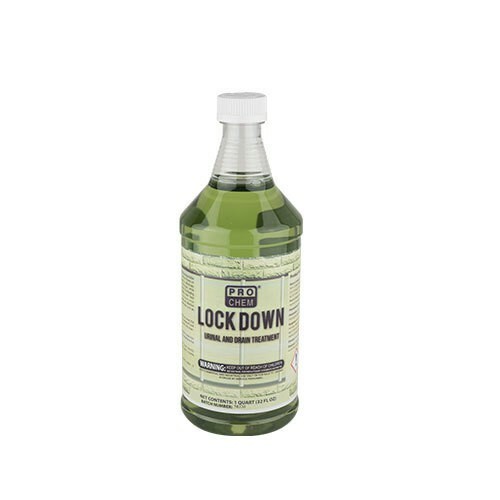 LOCK DOWN is a biobased, biodegradable treatment for use in waterless urinals, drains and sumps. This product floats on urine, water and other liquids in drains and urinal traps to effectively lock out the air that creates and carries odors out of the drain. It creates a safe barrier that seals and masks offensive odors. The floating layer starves drain flies and other insects by eliminating their food source. Dry drains, due to evaporation, will no longer be a problem since LOCK DOWN provides a constant moisture layer. It is also an effective barrier after using drain openers that contain strong chemicals such as sulfuric acid. DRAINS: For initial treatment, preferably at the end of the day when the flow is at a minimum, fill drain with water. Slowly pour 16 ounces of LOCK DOWN into drain. 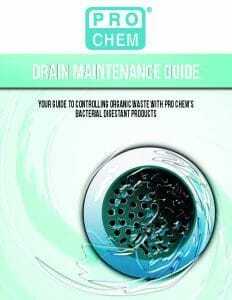 For maintenance pour 8 ounces per month into drain. After a large flow pour 8 ounces into drain. SUMP: Pour enough LOCK DOWN in sump to provide a one-inch layer. Multiply the width by the length and divide by 2 to determine the correct dosage in gallons. WATERLESS URINALS: Simply pour 3 ounces of LOCK DOWN directly into holes of trap to fill filter cartridge. Refill as needed. Each 3-ounce application lasts for approximately 1,500 uses.